Successfully Added 1080p Indoor IP Camera - 1/3 Inch CMOS, IR Cut, 5M Night Vision, WiFi, App Support, PTZ, Motion Detection, Dual-Audio to your Shopping Cart. Thanks to its compact design, this FHD IP camera can be used perfectly in homes and offices alike. 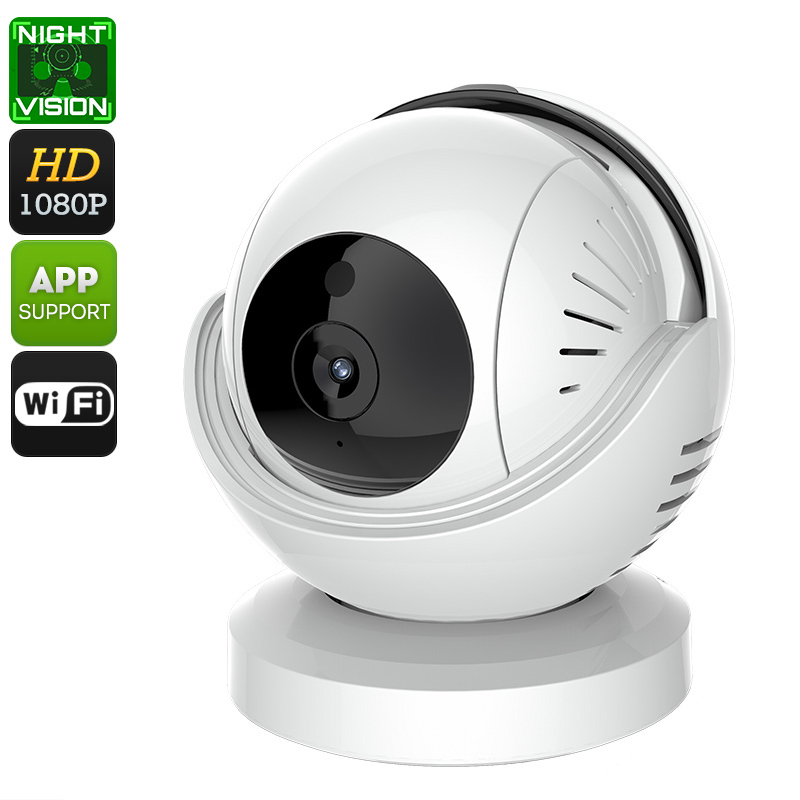 It supports WiFi connectivity which allows you to access your IP cam via your smartphone. No matter where you’re at, from now on you’ll always be able to keep an eye on what’s going on in your living room or office. Your IP camera furthermore features a built-in speaker and microphone. These allow you hear what’s happening while simultaneously providing you with a way to communicate with visitors or possible intruders. By supporting motion detection, this indoor security camera informs you instantly whenever movement has been detected. When an intruder has been spotted, your IP camera will call your phone and start recording. All security footage will be saved automatically onto your camera’s 32GB SD card slot. Thanks to this, you’ll always be informed when there is a security breach. Additionally, your camera will provide you with Full-HD footage that can be used later on for insurance purposes. Thanks to its 5M night vision and IR cut, the security camera protects your property around the clock. This indoor security camera comes with a 12 months warranty, brought to you by the leader in electronic devices as well as wholesale electronic gadgets.. Very good camera, product well packaged, safe and secure, easy to use and very very detailed captures! Thank you! As for Greece, customs offices kept my packagde for furhter ispection (price above 22€). The price was 52€ and i had to pay extra 30€ to the customs offices.